It is widely known that having hardwood floors installed in your home increases its value. On the other hand, having them installed, plus the material itself, can be costly – but nonetheless beautiful. In addition, I am sure you want to keep it that way: beautiful, and valuable. It is possible that children are running around your home dripping liquids out of their sippy cups. Your house guests may be tracking winter snow filled with salt into your home. Perhaps you have pets that enjoy dashing around as their claws grip your floor for traction. Regardless of your home situation, caring for hardwood floors can be rather simple, if done regularly, and not as difficult or tedious as you presume. The simplicity of caring for your hardwood floor consists of two major aspects: careful maintenance and periodic floor refinishing. If hardwood floors are one of the heroes for your home’s value, then spilled liquids are one of your floors villains. Spills typically cause extensive discoloration, staining, and possible warping if gone unnoticed or left unattended. It is true that hardwood floors are less absorptive than carpets, but wood is still porous and can possibly stain as easily as carpets. Therefore if possible, mop away spills as soon as possible, preferably immediately.Get in the habit of using dry mops for your normal, everyday cleaning.In addition, do not allow damp items such as winter boots or wet mops to sit for a prolonged period on your floor where they will undoubtedly mildew, warp and stain.Going back to your house guests,it is imperative that you keep a dry mat on the inside and outside of your front door where your guests can wipe their muddy or snow-packed shoes dry. The most common scratches on your floor are caused by dirt and grit rubbing against its surface. This way of scratching typically goes unnoticed because of the small elements that are doing the scratching. Having a regular cleaning regimen will certainly reduce the amount of scratches from dirt and grit. Other scratches that people are more aware of, and careful abou,t are scratches from furniture movement. Simply make certain your furniture is padded underneath. When moving furniture, lift it instead of dragging it. It is inevitable that your shiny hardwood floor will dull over time, even if you have the strictest maintenance routine. Your floor’s shine is attained through its finish, the top coating on the floor. Sunlight and regular usage will gradually wear away the wood finishing. Periodic floor refinishing and resurfacing will bring back your floor’s luster.There is no standard time frame when you should have your floors refinished, but a good guideline is simply to do it when they need it. A professional will be the best judge for this. They won’t tell you to refinish your floors before needed because the sanding process may strip away beautiful grain that may have taken years to build up. Prevention is often better than repair. So care for your hardwood floors with regular, careful maintenance and periodic refinishing. 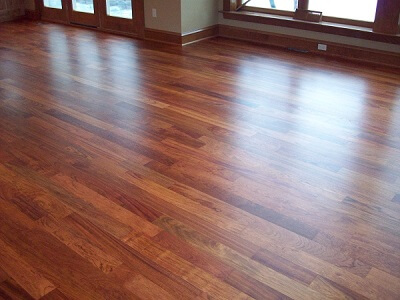 This article was written by Steve Pisano for Vacant Interiors of Denver which has been providing a wide variety of professional services, including refinishing, maintenance, and installation of hardwood flooring, to its customers since 2004.